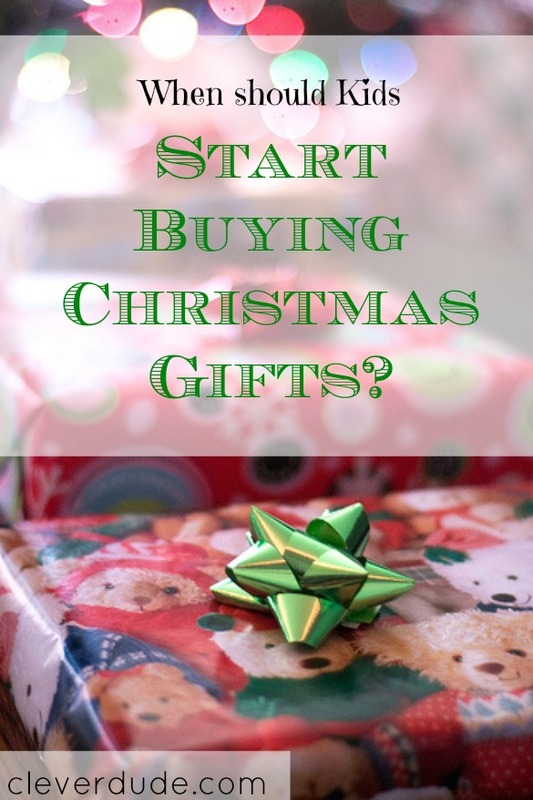 When Should Kids Start Buying Christmas Gifts? My mother-in-law had planned to come to town to go shopping with my wife this weekend. When my son found out, he asked if he could go shopping with her first, by himself. He wanted to go shopping for Christmas gifts for my wife and I, and obviously he can’t do that if we take him. At the age of 14, this is the first time he has expressed an interest in buying us gifts. I had thought about this a little in the past wondering if, and when he may determine giving gifts to us was something he wanted to do. I can’t remember when I started buying gifts for my parents, but the first present I bought my dad was a pack of gum. I wrapped it up and put it under the tree, but when he asked me what I got him I spilled the beans without blinking an eye. That probably says something about how young I was at the time. With a smile on his face, he and his grandmother walked out the door for shopping and lunch. He left with $60 he had saved from his allowance, and came home with $10. I have no idea what he bought. Obviously he was paying attention to things my wife and I have said to have ideas as to what to buy us. A gift under the tree from our son isn’t needed. But I know that his gifts are from the heart, and show his appreciation and love for us. The box could be empty for all I care, just the fact that he thought of giving us something means a lot to me. Do you have school age kids that buy you gifts for the Holidays? At what age did they start? Do you set an amount for how much they can spend or do you leave it up to them? My son came home from his first year of college with gifts for us. I was so touched, I cried. 🙂 Like you said, the boxes could’ve been empty, but the fact that he thought of us and appreciated us meant so much. I was buying gifts for my mom and dad when I was ~8, but of course the money came from my allowance which was given to me by my parents so, technically, they bought their own gifts! Our son has been buying gifts for his cousins with his own money since he was 5. He’s 12 now. For the first few years, he was happy to make sure that everyone knew it was with his own money. @susan – Buying the gifts with his allowance is where my son is at right now too, although he does periodically earn money from other places. However he does have to do weekly responsibilities to earn his allowance, so I try not to think of it as us paying for the presents he’s buying us. 🙂 It’s amazing how kids change when they go to college – I’m interested in seeing how my son changes. I remember sitting in my dorm room after a few weeks of college suddenly thinking about how smart my parents were! Thanks for sharing your story and your thoughts! @Bryce – that’s awesome…I can just imagine a 5 year old pronouncing, “I bought these with my OWN money!” Hmmm, maybe it’s something I did wen I was young as well….haha – thanks for stopping by! @MoneyAhoy – great point….there’s the whole financial lesson to be had, BUT there’s also the lesson of how rewarding it is to give to others. Thanks for the reminder! Even if you are two or ninety, they are still good. However, the right age to buy presents for others would probably be ten or twelve. @David – It probably depends a little bit on the maturity level of the child, but 10 sounds about right to me too. Thanks for sharing your thoughts!